Available in both FRENCH and in ENGLISH. 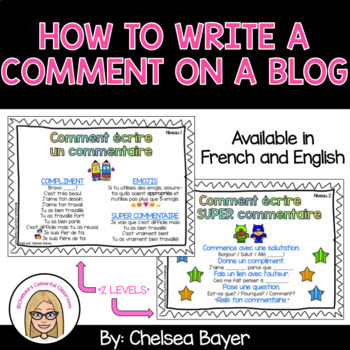 These posters are great for teaching your students how to write comments on a blog! There are 2 levels. I recommend printing them back to back and laminating a few (I use 5 in my classroom) for students to grab and use in your classroom any time they need. For beginners (or modified students) who need some ideas and model sentences to copy from. There are also instructions for how to comment with emojis and some SUPER comment ideas. 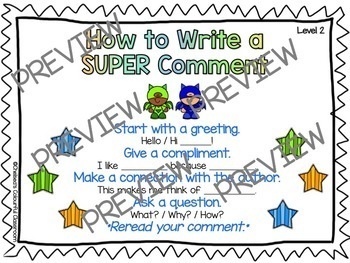 This poster shows how to write a SUPER comment. 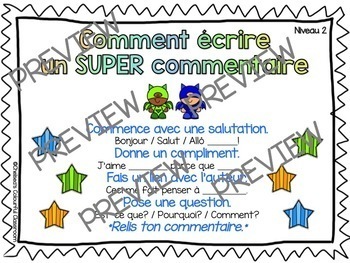 In Grade 1/2, sentences can be basic, but as the students get older you can ask them to make more specific compliments. 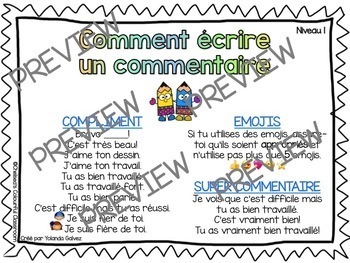 I still let students use emojis and the sentence ideas from Niveau 1 (if they need). *For making a connection with the author (Fais un lien avec l'auteur), I verbally tell students that some work you may not be able to make a connection to the real world (ex: a math problem). If this is the case, they need to come see me, and I may ask them to write a bonus sentence instead to replace it. I hope that you enjoy these posters and that you find them useful for blogging in your classroom! Special thanks to my colleague and friend, Yolanda Galvez, for helping to create the Level 1 poster. Special thanks to Kimberly Geswein Fonts and Creative Clips.